Departement of the Hautes Alpes - Population : 716 inh. - Altitude : 1,200 m.
9 km South-West of Briançon via the N94. 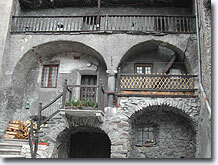 This is a modest village, consisting of a few faded houses facing onto a grey street. 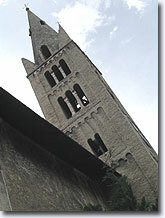 Saint Martin de Queyrières was built in the Middle Ages, on the pilgrims' route to Saint James of Compostella. 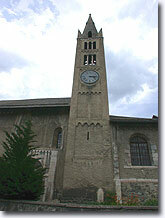 It has an old church, partly built in the 16th century which proudly points its beautiful Romanesque belltower of several stories towards the sky. We must not forget the Chapel of Saint Roch, made up of a strange hotch-potch of styles, dressed stones and a painted belltower. Nearby, you can admire the wall paintings in the Chapels of St Hyppolyte and St Jacques de Prelles, both dating back to the 16th century. With its little fountains and signs half erased by time, this gently dozing village will calm the most stressed amongst you... who can then take it out on the nearby climbing cliffs (over 60 climbing routes in all!). On the site of Les Vignettes, you will be astonished to learn that there are many caves in the cliffs, where there still remain traces of the wine-making activity which took place in this area. In 1939, 84 presses were still operating, which made it the highest vineyard in Europe, at an altitude of 1,250 m ! 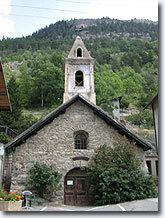 Saint-Hippolyte chapel (16th century) at Le Bouchier. Saint-Jacques de Prelles chapel (16th century). At La Roche de Rame, Saint-Laurent church (15th century). Eco-museum at Mas des Bonnaffés, which tells visitors about yesteryear's traditions and way of life. Several climbing sites at Le Bouchier and Les Vignettes. 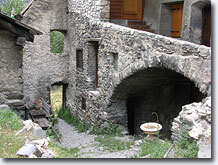 L'Argentière-la-Bessée (7km) and Briançon (9km).